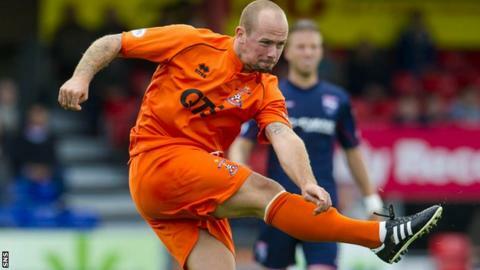 Jamie Hamill believes that "cool heads" will be required when Kilmarnock meet their local rivals Ayr United in the Scottish League Cup. A crowd of more than 7,000 is expected at Rugby Park, and the expectation is of a typically heated derby encounter. Hamill has not always maintained his self-restraint on the field, but he knows the importance of staying calm. "I've played in three and I'm undefeated in them," he said. "But it's always a different experience." Hamill returned to Kilmarnock during the summer, having spent three years at Hearts. There have been notorious moments in his career - including knocking over the Ross County manager Derek Adams last season - but he is one of the more experienced players in the Kilmarnock squad and will be expected to lead by example. Kilmarnock have started well in the Premiership this season, winning two and drawing one of their four league games so far. Ayr United, though, are leading League One with a 100% record and have lost only once in five games - a 2-0 defeat to Clyde in the Petrofac Training Cup. "It is really important that you don't get caught up in the atmosphere," Hamill said. "It's an Ayrshire derby back in town and they don't come about [often] with the different league positions. "You've got to play it with a cool head and hopefully we do that then come out with the proper result. It's good to have local knowledge, you know what these games are all about. "The boys know what to expect because they're playing every week in the Premiership, which will stand them in good stead for this game. "You've got to keep a cool head and play it as though it's a normal game and try to get the positive result from it. "The way the gaffer's got us going, we need to win everything, even in training. It's a good start to the league we've had and hopefully going into the cup game on the back of the Motherwell result will stand is in good stead." Kilmarnock manager Allan Johnston never experienced a game against Ayr during his time as a player at the club, and this will be the first time he has experienced such an occasion. He believes that the experienced players in his squad will handle the atmosphere, and that greater strength in depth - as well as new signings who are quick and powerful - have contributed to the team's positive start to the season. "You can tell how much it means to the supporters, they've been talking about this fixture for weeks, so we've got to make sure we come out on top," said Johnston. "We've got a lot of boys living in the local community and they're desperate to make sure we get the right result. "You need that edge playing in a derby as well, you need to make sure you're matching them all over the pitch. "The boys we've brought in have a point to prove, which is always good, they're hungry to do well, desperate to be playing week in, week out. "Look at [last] weekend, Craig Slater and Michael Ngoo were different class at Ross County and they were missing, then Robbie Muirhead and Sammy Clingan came in and did fantastically well, both of them got a goal, so it's pushing everybody on to do well."